Mattel's DC Universe Classics line may have its problems - distribution, construction, its stupid name - but so far they've been doing pretty well in the arena of character selection. And yes, that even extends to their "Acquire and Assemble" figures. Series 1 had a normal-sized guy with some big accessories and Series 2 gained some bulk with an evil monkey, but they really went huge for Series 3's Solomon Grundy. Cyrus Jones - 1810 to 1913 - made his great grandchildren believe you could live to a hundred and three. A hundred and three is forever when you're just a little kid, so Cyrus Jones lived forever. Wait, crap. That's Dave Matthews Band's "Gravedigger." Solomon Grundy isn't Cyrus Jones, he's Cyrus Gold. And I don't think he lived to 103. He died before the turn of the 20th century, and 50 years later rose from the brine of Slaughter Swamp to... shamble about and roust hobos, mainly. 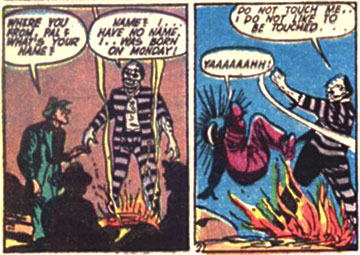 He also fought Alan Scott a bunch, until he was killed by Batman. You read that right, killed by Batman. Mr. "I don't believe in killing" incinerated his enemy in a blast furnace. Hero! DC Direct has given us a few Grundies before, but neither of them was very good: the first was heavily pre-posed, and the second, based on Alex Ross' Justice, didn't exactly match the familiar look. So Mattel has really found a character that needed some attention as a "Find and Form" figure. 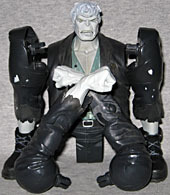 Grundy comes in five pieces, because Mattel decided that a six-figure casepack should have at least one duplicate. The breakdown is obvious: legs, arms, and trunk. The pieces fit together tightly, so you don't have to worry about them falling apart like Metamorpho did. The legs do come out of the hips if you press them too hard, so this isn't a case like Galactus, where the only way to get the pieces apart is to break them. All put together, the Solomon Grundy "Gather and Group" figure is more than 9" tall. Considering the various ways he's been drawn over the years, this is perfectly in keeping with the line's supposed 6" scale. His articulation is on par, as well, with the same 25 points the other DCUC figures get: ball and socket head, balljointed shoulders, swivel biceps, hinged elbows, forearm swivels, hinged torso, swivel waist, swivel-hinge hips, swivel thighs, hinged knees, and hinged rocker ankles. The torso hinge really won't move - it's free, it just doesn't have any appreciable range - but everything else is fine. Since all ["most." --ed.] of the DCU Classics toys use a few recycled bodies, the fact that the "Procure and Patch" figures are fully unique is a real break from the monotony. This is where the Horsemen are allowed to break out, so the sculpt is great. Grundy's tattered clothes hang badly on his frame, managing to be both baggy and too tight, and his thick shoes are scuffed. The buttons on his shirt even look like they were popped off. The places where his jacket and pants are torn have corresponding flaps of material beneath them, and there are even fully detailed tears under the jacket where you could never see them. 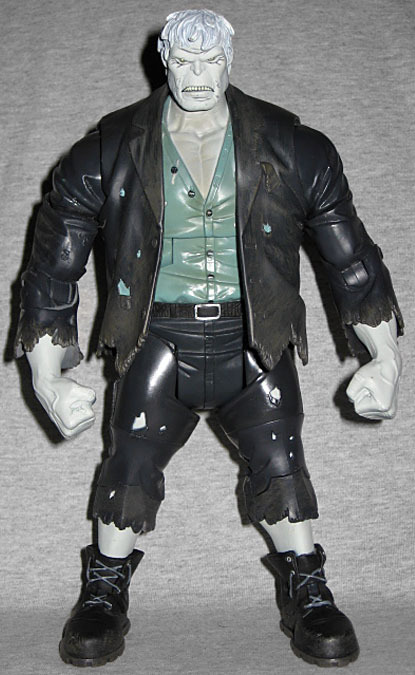 Solomon Grundy's skin is a chalky white, but it's not quite the same on all the pieces - one of the unavoidable drawbacks of a "Select and Solidify" figure. His hands and forearms are gray, but perfectly smooth; they look like a black and white photo of a normal person. Big veins, but that's not so unusual. The chest and neck are a bit better, but the best part is the face. His eyes rest under a tremendous brow, and his short nose points down to the cracked and wrinkled lips. The skin on his face is creased and pitted, and he's showing a single row of teeth. Top or bottom? Can't say. Could be either. Even Grundy's paint is good. His hair is lighter than his skin, so we get a little bit of variety, and there's a drybrushed brown on the lower edges of his suit, suggesting the way he's always living in swamps and sewers and the like. The buttons on his shirt are painted (as are the threads holding them on! 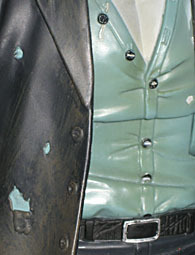 ), and the tears in his jacket are the same seafoam green as the shirt beneath. His shoelaces are grey, and they're sculpted to run through silver eyelets. There's a dirt drybrush on the soles of the shoes, too, a detail that would have been easy to overlook. 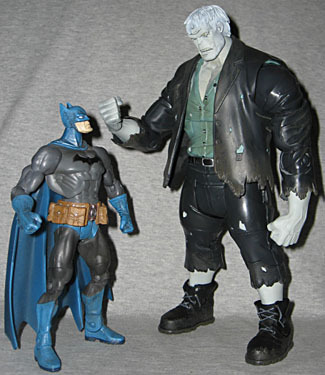 Solomon Grundy has become a fairly popular villain in the past decade or so, but he's never really had a toy worthy of him. Say what you will about Mattel and the DCU Classics line, they totally got it right with this... this... come on, I know I can come up with another pretend BAF name... Locate and Link! They totally got it right with this "Locate and Link" version.